Body contouring surgery includes various procedures to remove and tighten excess skin usually after massive or significant weight loss. It is also used to tighten saggy skin due to childbirth or ageing. 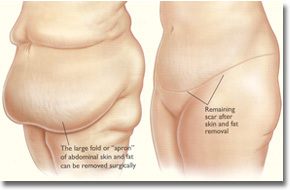 Body contouring surgery can improve a number of areas. Most commonly it is performed to contour the waist, abdomen, thighs, buttocks, upper torso and upper arms. Major weight loss whether after bariatric surgery or successful dieting, can leave loose skin that hangs in troublesome folds. The excess skin is not only uncomfortable and heavy, but can also cause health problems. It can stretch, become thin and be more likely to tear. All of these problems may be improved by surgery. The surgery may be effective in assisting with a normal clothing size, easier walking and physical activities, improved hygiene and comfort.